Fiordland is New Zealand’s ‘walking capital’. Now everyone pretty much knows about the famous “tracks”. 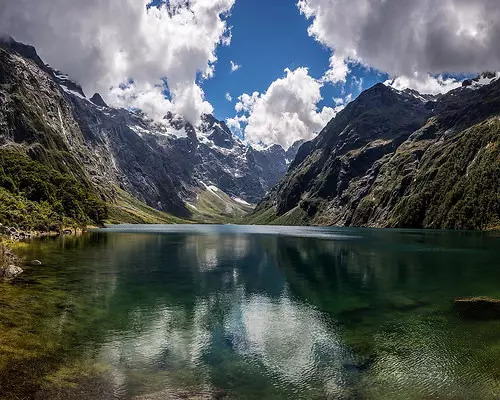 You’re bound to have heard of the Milford or Routeburn tracks, but there are a number of less known walking tracks in the Fiordland National Park. These shorter walks are just as scenic beautiful as big ones. And they’re are perfect for day walks. Travellers of all fitness levels can enjoy day walks Fiordland National Park has to offer. Some of these walks may take only an hour, while others may take a full day. What they all share, is beautiful scenery, pure oxygen and the birdsong. Over the years, I’ve walked most of these tracks. Day walks Fiordland National Park should definitely be included in every New Zealand itinerary. Lake Marian is an alpine lake, off the Hollyford Track road. Its the kind of lake that always seems to photograph beautifully. It sits in a valley formed by glacial action in what surely is one of the most beautiful settings in Fiordland. The lake is surrounded by mountains. When the weather is calm, this magnificent lake becomes a mirror of endless reflection. Now it really is far more practical to base yourself in Te Anau, if you’re going to do these walks. That means that you can be picked from Te Anau for a guided day excursion to Lake Marion. The journey to Lake Marion begins with a spectacular scenic drive along the Milford Road. This road will take you to the starting point for the Lake Marian walk. On the way, you’ll get plenty of opportunities for short nature walks and photographic stops. The hike starts off with a gentle walk. As you stroll pass a series of waterfalls, the track steepens and becomes quite rocky underfoot. The track then ascends through a forest of fuchsia, ribbon wood and beech trees. From the Lake Marian carpark, cross the swingbridge and continue to another series of waterfalls (10 minutes). After the waterfalls, the track becomes steep and sometimes muddy during the ascent to Lake Marian (1.5 hours). The track begins from the Lake Marian carpark which is on Hollyford Road, 1 km from the turn off. To find the Hollyford Road, turn off from the Milford Road (State Highway 94) at Marian Corner, a few minutes towards Milford Sound from The Divide. Marian Corner is about 87 km along the Milford Road from Te Anau. If you have a spare half day, give some thought to joining an affordable and comfortable, fully-guided walk. You’ll get to sample the picturesque Kepler Track This track is one of the great iconic New Zealand walks and is an easy and leisurely stroll. The path is well graded and approximately 11km in distance. The path leads you around the South end of beautiful Lake Te Anau. The journey begins with a water taxi ride across Lake Te Anau to Brod Bay. From Brod Bay, follow the walk through beech trees around the lake edge. The track has a gentle gradient and is suitable for most fitness levels. You’ll get a rest stop on the beach. At this point, refreshments will be served as an energy boost before you continue. This is a special time to drink in the magnificent views. Half way through the walk you’ll emerge from the bush to cross the Control Gates. From here, the track opens out onto open grassland to the Wildlife Park. The park offers opportunities to view the rare flightless Takahē. This huge and colourful bird is now restricted to the tussock grasslands of the Murchison Mountains of Fiordland. They get to share this space with native waterfowl, weka, parakeets, tui, kea, and pigeons. The Gertrude Saddle offers an adventurous guided day excursion from Te Anau, for a hike in the Fiordland mountains. Its this walk that really has the ‘wow’ factor. You’ll get unrivalled alpine terrain and spectacular views of Milford Sound from the summit. Leave from Te Anau and take a very scenic drive along the Milford road. This will take two hours to the upper Hollyford Valley and the Alpine Homer Hut. The drive leads into the heart of the Darren mountains and up into the sub alpine herb fields. Take note guys, the Gertrude saddle is challenging at times, but ultimately a great reward for the effort. The track is rough and rocky underfoot and follows the valley floor up to an imposing Barrier face. Once at the Barrier Face, the track commences a steep and steady climb to the chilled waters of the mystical Black Lake. You’ll then walk across giant granite slabs to the top. There are incredible views into the surrounding valleys, and down onto Milford Sound. On a sunny day, the Saddle is a wild, inspirational place for lunch. Another word of caution here folks! – it is absolutely essential to take warm clothing, as well as a good lunch and snacks. Hot drinks and energy snacks are carried by the guide, and there are tea breaks available. It takes about 3 hours to gain the saddle and nearly the same to return to the van. This is a more demanding walk than Lake Marion, and only suitable in good weather. Lake Marion is the back-up walk if the ‘Trips and Tramps’ guide deems the weather is not suitable for the Gertrude Saddle walk. From the car park, the marked track meanders up the valley through spectacular alpine vegetation. Once at the head of the valley, the route winds towards the saddle. There are no permanent markers after this point. Cross the Gertrude Stream below a large, steep waterfall area, about halfway up to Black Lake. From here, parts of the track are very steep and not suitable for those with limited tramping experience, or a fear of heights. The track goes up steep rock slabs so it is treacherous when wet or frosty – there will be steel cables to assist you. From the head of the valley, continue up through the boulders to the saddle. Return the same way. You’ll get breathtaking views of the valley and part of Milford Sound/ Piopiotahi from the Gertrude Saddle. This track provides excellent access to the mountains for experienced climbers. 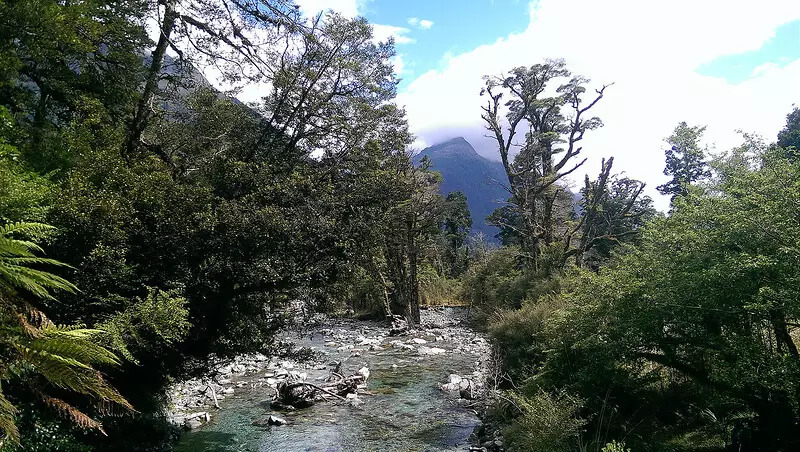 From the end of the unsealed Hollyford Road, this well graded track takes you on a short climb through rainforest to the lookout of the impressive Humboldt Falls. The walk starts from the end of the unsealed Hollyford Road. To find the Hollyford Road, turn off from the Milford Road (State Highway 94) at Marian Corner, a few minutes towards Milford Sound from The Divide. Marian Corner is about 87 km along the Milford Road from Te Anau. Allow 2 hours to drive from Te Anau to the end of the Hollyford Road. This walk is part of the Hollyford Track, which starts at the end of the Hollyford Road. 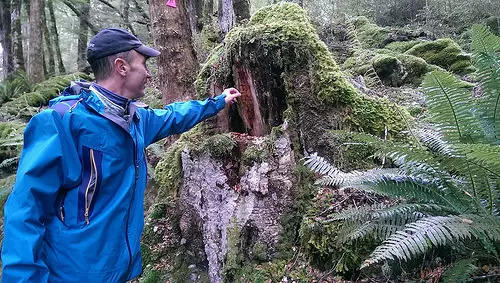 See Hollyford Day Walk blog. For information about all sections of the track, see Hollyford Track description. After crossing Humboldt Creek, follow the old road to the start of the track, which initially sidles along bluffs, with swampland to the left. Sections of raised board walk cross areas prone to flooding. Where Swamp Creek joins the Hollyford River/Whakatipu Kā Tuka the track follows the river bank with occasional views of the Darran Mountains. At Hidden Falls Creek the track passes Sunshine Hut (private), and continues upstream to the swing bridge. You can view the falls two minutes on from the bridge. You’ll reach Hidden Falls Hut 10 minutes after crossing the bridge. You can see Mt. Madeline from here. Return the same way. This is a good, valley-based day nature walk for families, which is less exposed when bad weather prevents walking other areas. Enjoy your day walk in the Fiordland National Park!